Home Car News Motoring Issues 2018 What is Adblue? Where to buy it, what does it do with diesel fuel? What is AdBlue and what does it do in diesel cars? ► Is this urea-based fluid harmful or toxic? For the past 20 years, automotive engineers have worked hard to produce clean diesel engines. Their problem has been to achieve this admirable aim while striving to meet shifting anti-emission regulations that are increasingly hard to pass. They’re a clever bunch, these engineers. And although internal mechanical efficiencies developed for diesel engines will take them so far, it’s clear that special systems needed to be introduced in order to keep ahead of those tightening anti-smog measures. When legislators decided that nitrogen oxide (NOx) emissions needed reducing significantly with the Euro 6 standard, fast moving car manufacturers were left with the task of overcoming another obstacle introduced by legislators. 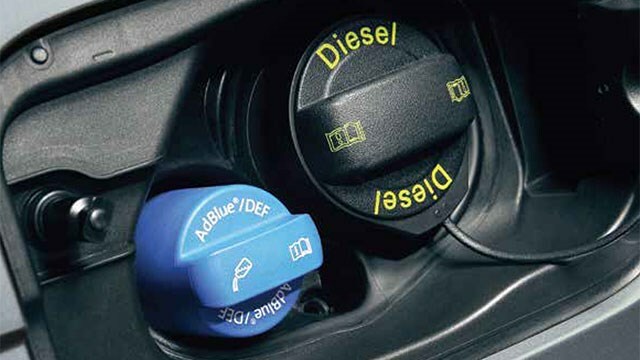 The introduction of ‘wet’ diesel particulate filters (DPFs) that require AdBlue was the relatively simple and low-cost way of trimming the amount of NOx pushed out at the tailpipe. Consequently, and in order to pass Euro 6 regulations, AdBlue is used in a rapidly-growing number of diesel-powered vehicles. AdBlue is a solution made up of urea and water that’s injected into the car’s exhaust system before NOx leaves your exhaust. After it’s fed into the exhaust, it reacts with the NOx produced by the combustion process, and breaks it down into harmless nitrogen and oxygen. It’s a case of basic chemistry – at high temperatures, AdBlue turns into ammonia, and it’s this process that breaks down the NOx. And this significantly reduces the amount of NOx particles in exhaust emissions. This process is managed by a Selective Catalytic Reduction (SCR) system. In a nutshell, AdBlue is injected through a catalyst in the exhaust. How can I tell if my car needs AdBlue? Quite simply, if you’re driving a newer diesel car, chances are it needs AdBlue technology. All the big diesel players – Volkswagen, Audi, Mercedes, Peugeot, Citroen and Jaguar – all feature AdBlue technology. Most give a clue in the name – Peugeot and Citroen’s BlueHDi engines feature it, while Volkswagen includes the initials SCR in the name of some of its diesel cars. Failing all else, we’d suggest looking in the car’s handbook to see if it comes with AdBlue. When do I need to top up AdBlue? Your car will tell you. When it’s running low and you get a warning flash up on your dashboard – you’ll get plenty of notice before it becomes an issue, but fail to top it up, and there will be consequences. Typically, a Volkswagen Passat TDI uses around 1.5 litres of AdBlue every 620 miles, and the tank size is 13 litres, so a full tank of AdBlue is good for about 8000 miles of driving. 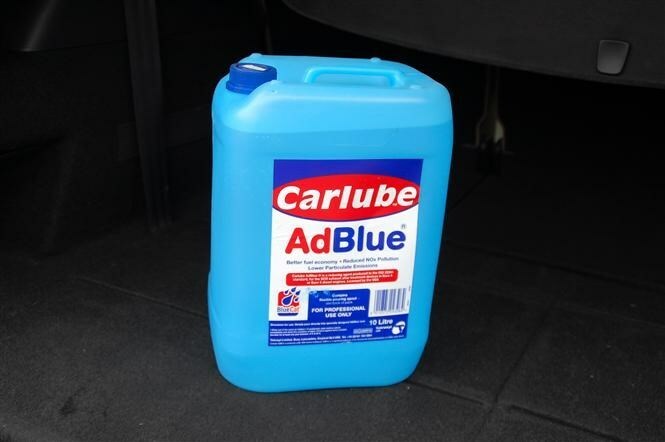 PSA says AdBlue needs topping up regularly at 12,500 miles and that this will be carried out as part of a scheduled servicing plan for most drivers. It’s getting more common. You’ll be able to get top-up bottles of AdBlue through your dealer, motor factors, or petrol stations. You don’t have to take your car to a main dealer for someone to do it for you – it’s a simple process, like topping up with screenwash. The location of the filler cap varies between cars. In some it’s located next to the fuel filler cap, while others are at the side of the boot or under the boot floor. Again, find this out before you get close to running out so there aren’t any surprises when you come to top up. What happens if I run out of AdBlue? Your car’s engine management system won’t stop the car, but when your AdBlue has run out, it will leave it not being able to start. 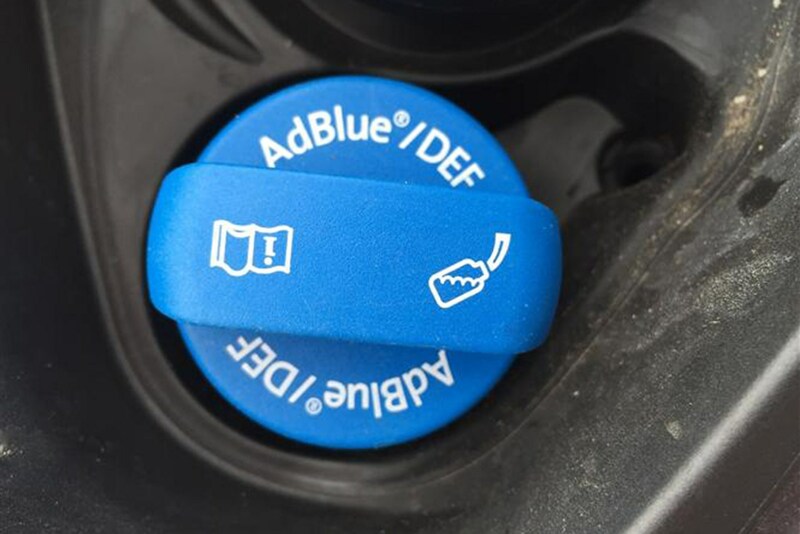 You’d be pretty unlucky (and careless) if you ran out of AdBlue, because most cars will warn you with about 1,500 miles in hand. You won’t be able to just stick a tiny amount back in the tank for it to work, either. A minimum amount will need to be replenished for the car to start again. We’d suggest you top it up as soon as the warning appears – it’ll save you hassle further down the line. 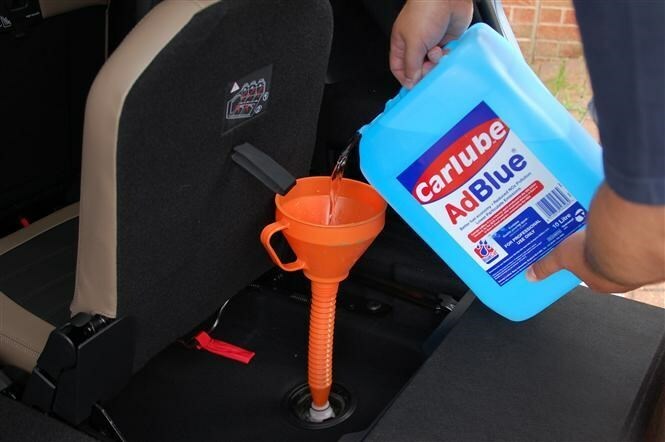 Some sources claim AdBlue is corrosive, and you need to handle with extreme care, if you spill it on your car or hands or car. Others say it’s harmless and that all you need to do if you get it on your hands is wash them thoroughly or give the car’s bodywork a wipe if you spill a little. As it’s basically urea, you’d want to wash your hands whatever. Storage is important. You need to keep at between -11 and 30 degrees C, and it lasts around 12 months in these conditions. In other words, it’s fine in your house or garage, but probably best not leave it in the boot – above 30 degrees C it starts to decompose.